A Maigret novel obviously doesn't exist without the presence of its hero. However, to exercise his talents, the Chief Inspector needs a foil; and thus appear the "second fiddles", victims, witnesses and suspects, whom Maigret confronts. Without forgetting, of course, Mme Maigret and his inspectors, who receive his affection. However, that is not yet enough to give scale to the scene... add to these a host of extras, who will furnish the space, and allow the novel to come alive. It's Simenon's talent to offer us a gallery of secondary characters, who appear more or less fleetingly, but who are nonetheless necessary to the plot. Sometimes described in just a few words, sometimes in a few sentences, the brevity of their appearance detracts nothing from the force of their presence at the heart of the plot. And so here, after the maids, concierges, housekeepers, judges and so on, a little review of some others of these secondary characters. The telephone is a tool often required by Maigret. In a time when there were not yet any of the mobile devices which have made today's communications so banal, the police had to find other ways of getting in contact or finding information. In Paris, when he's working away from his office, the Chief Inspector often goes into a café to telephone - a good excuse to order at the same time a little white wine or a brandy - which may explain why Maigret never uses public telephone booths, which could already be found at his time in the streets of the capital. In the cases he investigates outside of Paris, Maigret also finds the need to phone. When it's not from his hotel room, he naturally goes to the post office, where he meets the first of the characters examined in this study, the postmistresses. In the Maigrets, it's always a woman who takes care of the postal service and telephone, in the suburbs or the country. "Hello, Mademoiselle. ... I'm at city hall, and I'm afraid I'll have to bother you somewhat frequently..."
"Then he turned the crank of the telephone, greeting the attendant with a pleasant 'Bonjour'". "Hello, Mademoiselle! Still another call, if you don't mind? ... Thanks so much... But of course, I know you're doing everything you can, and before I leave I'll bring you some chocolates. You prefer glazed chestnuts? I'll remember..."
"It's me again, Mademoiselle... I'll have to double the quantity of those chestnuts..."
"Hello, Mademoiselle... Yes, it's me, yes... My debt of chocolates... No, that's right, you prefer glazed chestnuts... My debt grows greater and greater"
"What do I owe, Mademoiselle?... Thank you... Excuse me." "He saw her, petite, dressed in black, black hair, a face without age. She had the receiver in one hand, the plug in the other." Maigret had himself let into the post office, using the back door. He was too broad and too heavy for the little kitchen fitting for the tiny postmistress surrounded with china trinkets, spun glass bought at a fairgrounds, embroidered doilies." "She turned around, afraid, for the massive Maigret was right beside her, his hand extended, ready to grasp the receiver at the proper moment. ... She didn't dare resist the Chief Inspector, who authoritatively took the earphones and placed them over his head. She carefully placed the plug into its receptacle." "Good night, Mademoiselle. Have no fear. 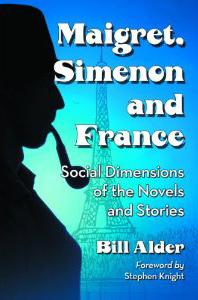 I will be discreet"
Bill Alder deserves kudos for Maigret, Simenon and France: social dimensions of the novels and stories, the book he introduced on this forum a few entries back. His stated aim was “to consider the role of social class and social change in the Maigret writings.” The result is a well-researched, well-documented, and well-written work. In focusing on whether Simenon (consciously or not) presents an accurate portrait of French society, Alder offers many fascinating revelations about the times, providing me with an unexpected, new sense of appreciation of Simenon as a writer. “Progressive penetration” is Alder’s term for Maigret’s method of “soaking up… progressively penetrating… applying pressure… until the criminal reveals him- or herself.” Describing the method of the man who had no method as “a social rather than a logical or technical approach to police investigation” seems to me to be right on target. I am hoping you will have have the knowledge, to satisfy our curiousity. On a recent (several weeks ago) Maigret episode, Maigret & the Ghost (aka Maigret & the Apparition; Maigret et le fantôme [FAN]); we're trying to determine why the change of venue from Paris to Helsinki, for the episode. My friend, an avid reader of the Simenon novels, maintains that the original book took place entirely in and about Paris, whereas the Bruno Cremer production had him travelling to Helsinki, Finland. I have scoured the web & even contacted MhZ directly regarding the cause for the change of venue, but neither they nor my own websearch have proven fruitful, thus far. "[The episodes of the series] required very high budgets, since, unlike those of the Jean Richard series set in contemporary times, the new series was set in the France of the '50s. All the scenery had to be created! Each episode cost an average of 1.5 million euros. Furthermore, La 5, co-producer of the series along with Antenne 2, was unable to continue... the channel went bankrupt at a great loss... 300,000 euros short for each of the twelve episodes to come! So the producers, Robert Nador and Eve Vercel searched for European co-producers. They approached Belgian television (RTBF), Swiss (TSR), Czech (Ceska Televize) and Finnish (Finnish Broadcasting TV1). Ultimately, many episodes would be shot abroad, especially, though not all, in Eastern Europe, to reduce production costs." 3/18/13  Discovery of this Forum has brought absolute delight to this (almost) 75-year-old mystery reader, and (almost) new computer user! 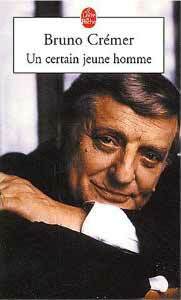 I have been looking for a copy of Bruno Cremer's autobiography, "Un certain jeune homme" [A certain young man], in English. Can anyone help? 3/26/13  Hats off to Murielle Wenger. She’s done it again. This thoroughly researched and documented exposition saves those eager to delve into Maigret’s world a lot of trouble. As a bonus, even without any knowledge of French, one can enjoy her wonderful presentation of covers. 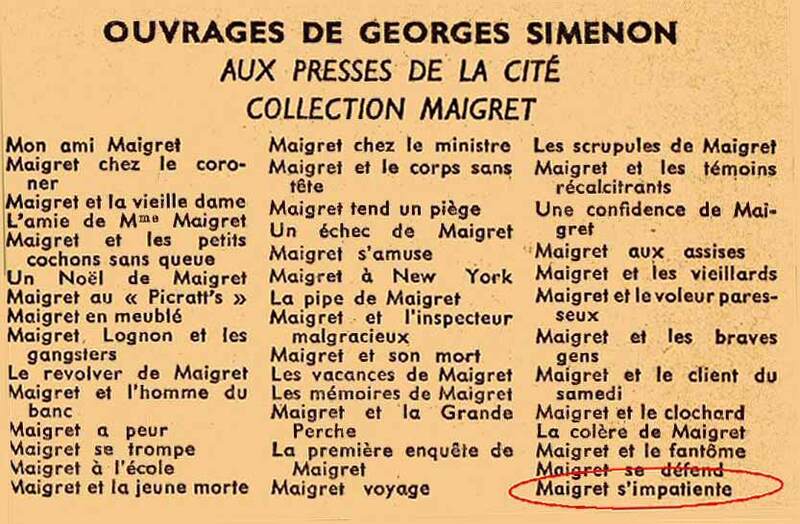 Now we find that in the list of the Maigrets, the latest one to appear at that time (original edition, Nov. 15, 1965), La patience de Maigret [PAT], is listed under an unexpected title... "Maigret s’impatiente" [Maigret is impatient]! 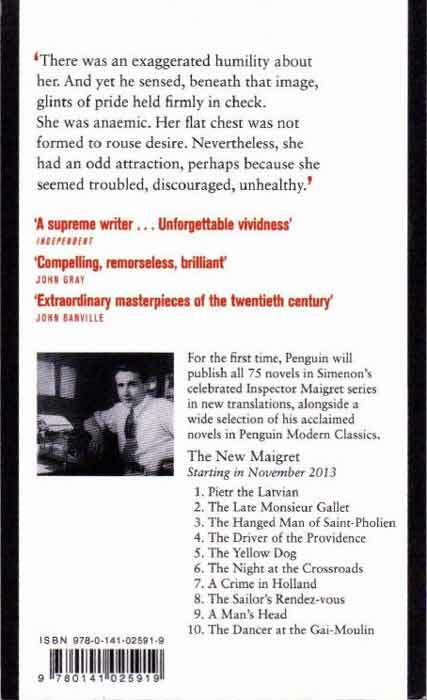 This is all the more surprising since this title does not appear as an alternative title on Simenon's yellow preparatory envelope, and what's more, the novel, La porte shows a publication date of Nov. 20, actually after the publication of La patience de Maigret. Bruno Cremer DVDs - Confusing information! 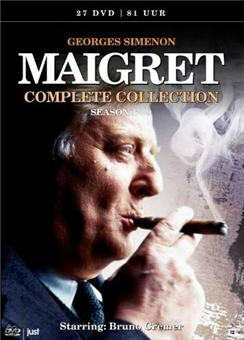 3/29/13  FNAC appear to be offering a complete set of the Bruno Cremer Maigret, i.e. 27 DVD's 54 Episodes for a price lower than a single Coffret (10 episodes), namely 70,98 euros. Supposedly with English sub-titles. To my knowledge they have so far only issued the English sub-titles up to Volume 21, although volumes 22 to 27 may be sub-titled in the USA. Can anyone confirm whether this package does in fact have English sub-titles covering Volumes 1 through 27? The cover is written in English. re: Bruno Cremer DVDs - Confusing information! The coffret offered by Fnac (also offered here at Amazon) is in fact a Dutch edition. The subtitles are in Dutch, and apparently not in English. To learn more about this edition, see this page: Videos hollandaises. Happy Easter to all the internet Maigretphiles! re: Bruno Cremer DVDs - A cigar!? 3/30/13  I can see the confusing information on the Fnac site... 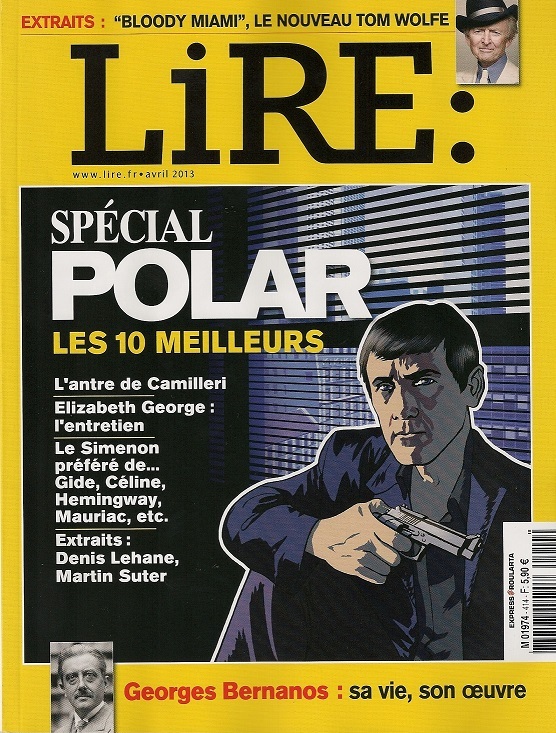 It says a little lower on the page that it was published in September 2011, and that the languages are French and English, and the subtitles in German. (Clicking on the "ask a question" button brings no result.) Ads for the Just Entertainment (Dutch) series also indicate that the languages are French and English, but that the subtitles are in Dutch... Looks like Fnac has it wrong. Has anyone actually seen any of these? 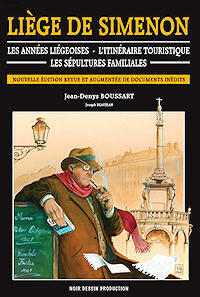 But the real question is... why is Maigret (Crémer) smoking a cigar on the cover?! I can only find him smoking a cigar four times in my casual search of the corpus... and then just as a last resort. More often then not he disdains cigars! 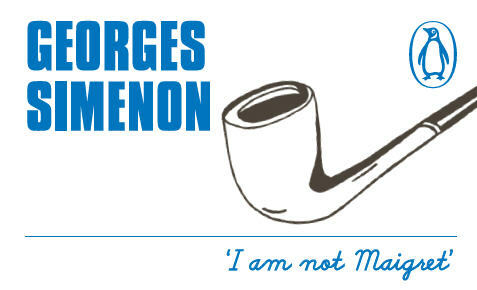 4/1/13  Maigret smoking a cigar?! Very poor choice. Not because of the cigar, since we all know Maigret was a 'pipe man', but because smoking is not socially acceptable anymore (and not a moment too soon, if you ask me). Much more so in North America than in Europe. British Columbia is a leader here. No smoking anywhere inside of all public buildings, which covers offices, stores, schools, restaurants, buses... Sorry, but that cigar on the cover is not good for sales here. As a translator (one who believes that Simenon's novels constitute much of the finest work produced in France in the 20th Century) I've been campaigning for years to have him retranslated. Initial attempts fell of deaf ears, but eventually I manage to persuade Bloomsbury in the US to look into a major revision of the work. Unfortunately, that too was stalled because then rights-holders Chorion imposed conditions on any new translations that would have been impossibly onerous for both publisher and translator. I'm not sure when the first titles will be published - and the project is obviously one that will take some 10 years to complete, but I thought you'd be interested to know. 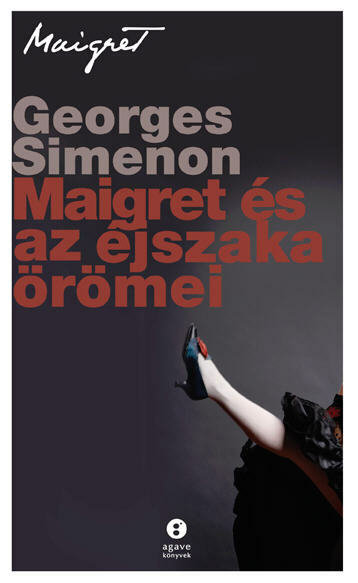 4/24/13  Interesting info from Frank Wynne about re-translation of Maigret by Penguin, the new owners of Simenon copyrights. I think that periodic re-translation of literary works is a positive idea, in principle. It makes the language clearer for today's readers. Translators will know, of course, that Simenon avoided 'dating' his stories, so translators will avoid this, too (no cell phones or computer database or email, for example; replacing 'politically-incorrect' statements is fine). Now, what about the original text in French? Does this mean French-language readers will continue reading some Maigret books in language from the 1930's while English-language readers will enjoy text adapted to the 21st century? 4/27/13  I don't entirely agree with Vladimir (4/24/13) on these grounds: The novels were a product of their times and much can be learned from them of those times. Ergo "politically-incorrect" statements should be left as they are unless the whole plot and all the characters are advanced to be set in current times. Surely Vladimir wouldn't want Maupassant, Zola, Balzac etc. mucked about with! Also the novels, Maigret and non-Maigret, spanned enough years to show how things change over the years. 5/2/13  Just an observation, but the fact that this complete edition has been issued in the EU, released in its original French language and only with Dutch subtitles surely makes somewhat of a mockery of the BBC hiding behind the fact that they can only re-issue the old BBC Maigret series if they include a selection of EU subtitles? I guess in this financial age there is not going to be anyone out there willing to pay the substantial fees required to create the translations in any case, such a shame and IMHO a very poor decision on their part! 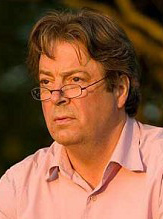 Roger Allam 5/4/13  I hear the BBC are planning to make and broadcast a new series of Maigret. Roger Allam is first choice for the part of Maigret, when I saw him in the series Endeavour I thought then what a good Maigret he would be. I look forward to this project coming to fruition. 5/4/13  I agree with Martin. From what I can gather regarding Roger Allam, he seems extremely well qualified to portray Maigret. He’s already a pipe smoker, but he does need be sure he’s carrying enough weight. 5/10/13  Curious how producers will decide which 'Maigret' to film. Not Gambon's, surely. If they are open to comments from future viewers, I suggest 'Saturday Caller". 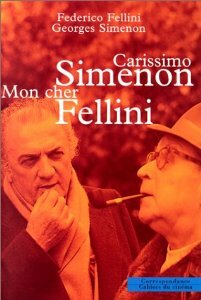 5/14/13  A year ago I attended a screening at the BFI in London of Le Chat, the 1971 film of Simenon's novel. I got the impression that many of us there that evening were Simenon enthusiasts. Who else happened to be in the audience? None other than Roger Allam. What he sought, what he waited and watched out for was the crack in the wall. In other words, the instant when the human being comes out from behind the opponent. Who is Peter the Latvian? Is he a gentleman thief? A Russian drinking absinthe in a grimy bar? A Norwegian sea captain with a wife and children? A twisted corpse in a train toilet? Or is he all of these men? 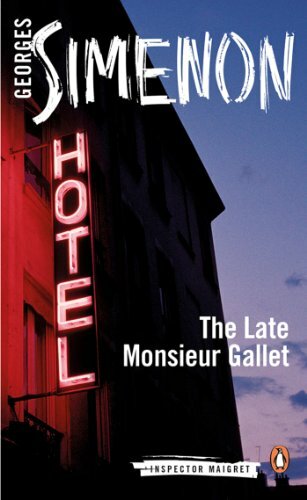 In Simenon's first novel featuring Inspector Maigret, the laconic detective is taken from grimy dive bars to luxury hotels, as he solves the strange enigma of Pietr the Latvian. 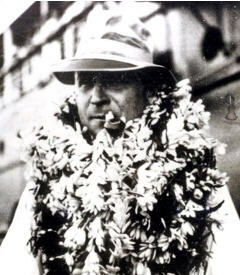 Georges Simenon was born in Liège, Belgium, in 1903. Best known in Britain as the author of the Maigret books, his prolific output of over 400 novels and short stories has made him a household name in continental Europe. He died in 1989 in Lausanne, Switzerland. David Bellos is Director of the Program in Translation and Intercultural Communication at Princeton University and has won many awards for his translations, including the Man Booker Translator Award. On rereading La nuit du carrefour [NUI], and watching the episodes adapted for the television series with Jean Richard and Bruno Crémer, I wondered about the description of the location, the "Three-Widows Crossroads" where the core of the action takes place. "You then rented a country house on the national road between Paris and Etampes, some two miles from Arpajon, at the place called the Three-Widows Crossroads." A crossing. A garage with its five gasoline pumps, painted red. On the left, the Avrainville road, marked with a signpost. Since we know that Maigret has come from Paris, passing through Arpajon, we know that the route to Avrainville is actually on his left. We're at a true crossroads. All around, fields as far as you could see. "We're here!" said the driver. There were just three houses. First, that of the garage keeper... Opposite that, a millstone villa... A copper plaque, "Emile Michonnet, insurance." The other house was 200 yards away. The wall surrounding the yard only allowed a view of the second floor, a slate roof, and some fine trees." Now we have to position the three houses around the intersection. Two early indicators allow us an approach to the locations... first, in the transcript of the interrogation Maigret was reading, it said, "At 7:00 a.m. Sunday morning, M. Emile Michonnet, insurance agent, who lives in a villa 100 meters from you..."; Lucas, on location, had telephoned Maigret: "Hello! I'm at the Three-Widows Crossroads. I'm calling from the garage which is about 100 yards from Andersen's house"
We can thus place Michonnet's villa closer to Andersen's house than the garage. But how to position the three houses with regard to each other? That, as we will see, is where the problem lies. "The two of them walked in the darkness, along the shoulder of the road... They had reached Michonnet's villa, which was like one of the points of a triangle, whose other angles were formed, on one side by the garage, and on the other by the House of the Three-Widows. Forty yards between the garage and the Michonnets. A hundred yards between them and the Andersens. Connecting them, the shining, regular ribbon of the road..."
"Maigret regarded the triangle... On the right, the main road, opposite the garage, the Avrainville road branching off..."
6/15/13  My university research is in Literary Tourism and I focus on Concarneau and The Yellow Dog (Le Chien jaune) [JAU]. I would be very grateful for any anecdotes or comments anyone can add to my Google+ Community for my work. 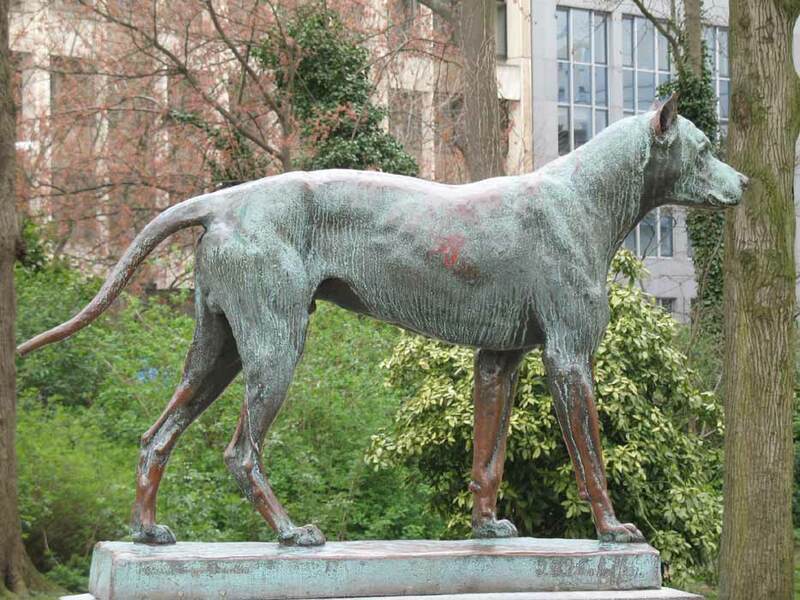 If you would like to read my most recent conference paper on Maigret and The Yellow Dog, it is freely available on the Academia edu web-site under my name, or click here to read and/or download a copy [in French]. I’d just like to say thank you to Steve Trussel for managing and maintaining this valuable resource. The stories surrounding the Liberty Bar [LIB] entry have been particularly useful in my academic research and for our fieldwork with tourism students in March 2012 in Cannes and Antibes. 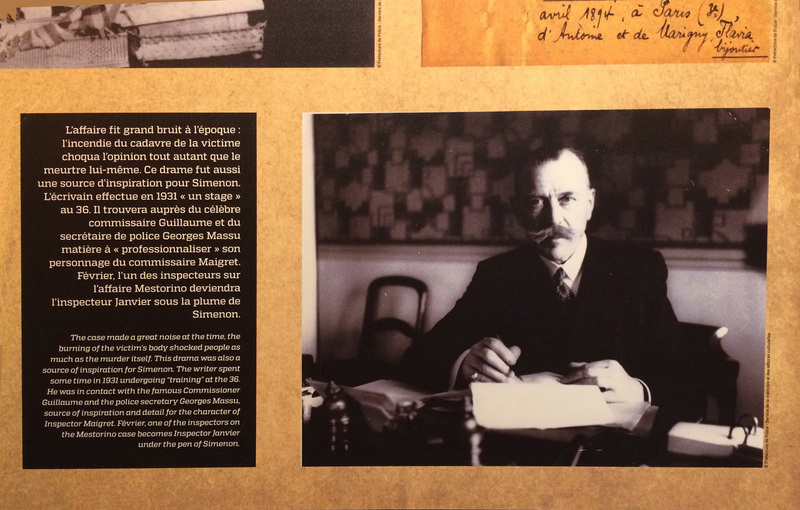 6/18/13  I am curious whether any original Maigret manuscripts have survived? Can be seen in a museum, for example. 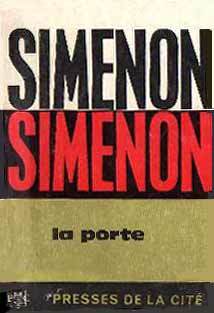 By the way, the 25th anniversary since Simenon died approaches - any commemorations planned in France, Belgium? 6/18/13  Here are the covers for the first of the new Penguin translations mentioned in my post of 20th May. 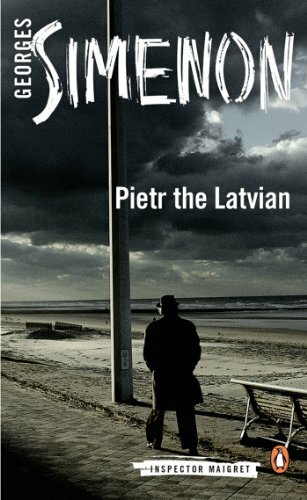 Pietr the Latvian is translated by David Bellos. 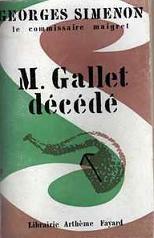 The Late Monsieur Gallet is translated by Anthea Bell. 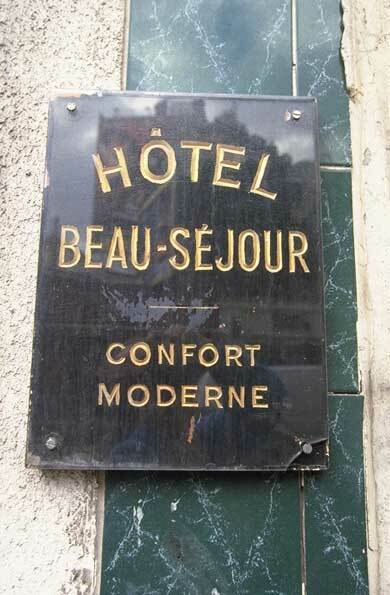 6/27/13  The cover of new book to be published by Penguin (June 18, 2013 post, below) reminded me that many of Maigret's "clients" (petty criminals or near-homeless) lived in hotels. Could that be true? If that was true, there used to be plenty of inexpensive hotels in Paris during Simenon's time. Not anymore, at least I did not see any. 7/03/13  I was reading Murielle's article about Maigret at the Crossroads [NUI], especially her description of the layout of the intersection and where named items were in relation to each other. That got my attention so I went on Google Earth and had a look. Here's what I came up with. First, the crossroads is no more. The Avrainville (Postcode 91360) road now passes over the road from Etampes to Arpajon and Paris. The site is 36.8 kilometers south of the Quai d'Orfevres. The road from Etampes to Paris is now the N20, which is like a US federal highway or an A road in the UK. In this area it is a limited access highway with a barrier between the two directions of travel. There are two lanes in each direction. The road from Boissy-Sous-St.Yon to Avrainville is the D26. That's a state highway in the USA and a B road in the UK. There is no village or settlement at the site today. It's a 'zoning' or industrial park/estate now. Boissy is a crescent-shaped village. The D26 goes through the center about one inch/25mm to the left of the crossroads in Muriel's diagram. It swings around so the outer edge meets the the N20 about one inch/25mm below the crossroads. A small part of it crosses the N20 as it is today. This is about 1.4 Km south of the crossroads. At a point 750 meters south of the crossroads there are a few isolated buildings on the right side of the road going south. These are screened off by a low concrete fence and some tall trees. It's possible that people are living there but it is obviously a commercial property. The part of the D26 that's to the left of the crossroads is called the Route d'Avrainville. On the other side it's the Rue des Cheminets, at least as far as Avrainville. As there are no settled areas on either side of the N20, it is the Route Nationale but it is the Avenue de Paris in Boissy. 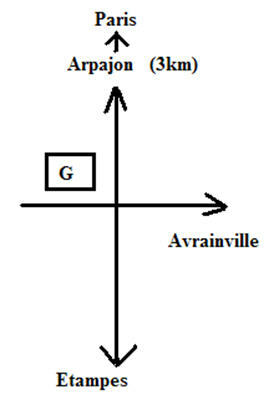 Avrainville is 1.7 Km east of the crossroads while Etampes is 15.2 Km to the south. 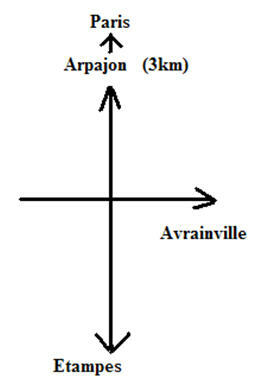 Arpajon is 3.9 Km to the north and Boissy is 1.2 Km to the west. Things certainly have changed in this location since Simenon wrote about it. 7/6/13  Is it possible that Simenon personally never visited the site of the 'Crossroads', and his description was fictional? But it is interesting to see a map of Paris / France / Europe with marks where Maigret cases took place. 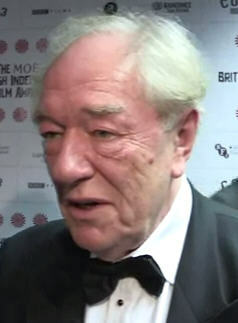 "...Sir Michael Gambon’s career as an actor spans six decades, working across theatre, radio, television and cinema. Gambon’s iconic role in the television serial The Singing Detective won him his first of four Best Actor BAFTA TV Awards and roles in dramas such as Maigret made him a household name..."
7/7/13  In response to Vladimir's question [06/27/2013], I'm sure there are hundreds of cheap hotels to be found across most of Paris these days. I don't think that you'd want to stay in most of them but they are out there. Most of them won't be in any tourist or travel guides as most belong to the parts of Paris that the city's tourist office would prefer didn't exist. Although the old Hotel Beau-Séjour, for example, at 1, rue Lepic is now the Residence Blanche and is around EUR 100 per night, it seems to have been renovated and looks better on Street View. Then again, 100 a night is cheap for Paris these days. I used to ride from Bruxelles to Paris and back on the trains because it was cheaper than a hotel if you booked in advance. As I said on here some time ago [In the Footsteps of Chief Superintendent Jules Maigret in Montmartre], a sejour there would appear to be anything but beau. Some of the backpacker guidebooks may list some of these places. I wouldn't expect more than a few of them to have a website. 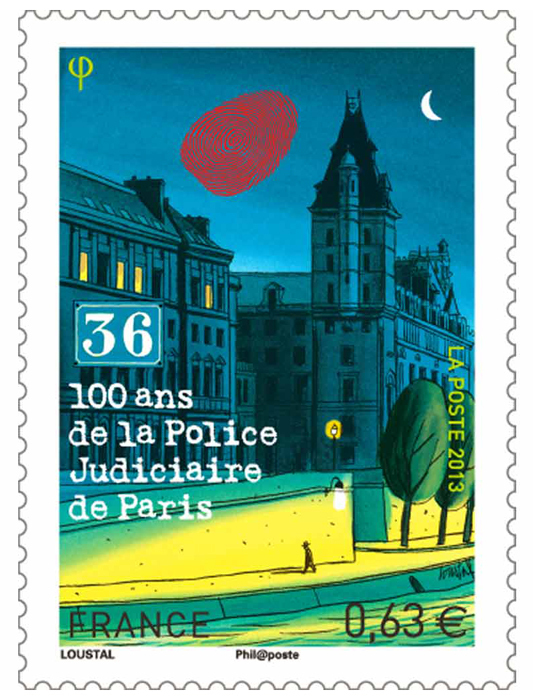 A stamp in honor of the mythical headquarters of the Parisian Police Judiciaire, 36 Quai des Orfèvres, will be put on sale in September on the occasion of the 100th anniversary of the Parisian PJ, the Postal Bureau announced today. Designed by the bandes dessinées artist Jacques de Loustal, this stamp, with a face value of 0,63 euros, represents the facade of 36 Quai des Orfèvres against a night sky. More than 1.5 million stamps are planned for release by the Postal Bureau and will be on sale from September 13, the official first day of issue. 7/26/13 	I am studying French. 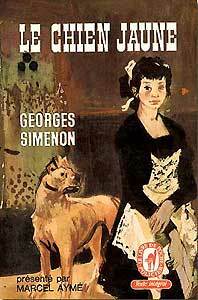 I am working my way through several Simenon nouvelles. I just today stumbled on this site while trying to understand what "le dogue d'Ulm" (from "Le Chien jaune") means. Thanks for this wonderful site! What a great resource. Given the age of the statue, Simenon surely must have known it. There's a lot more on the statue on the web. 8/13/13 	Just in case Keith in Manhattan might have missed it, there's some fascinating forum discussion about this work beginning in January of 2004: 1/1/04, 1/2/04, 1/4/04, 1/9/04, 1/10/04, 1/15/04, 1/18/04, 1/21/04, 1/26/04. 8/13/13  Just finished Maigret and Wine Merchant, and cannot stop wondering how differently the story would unfold today. 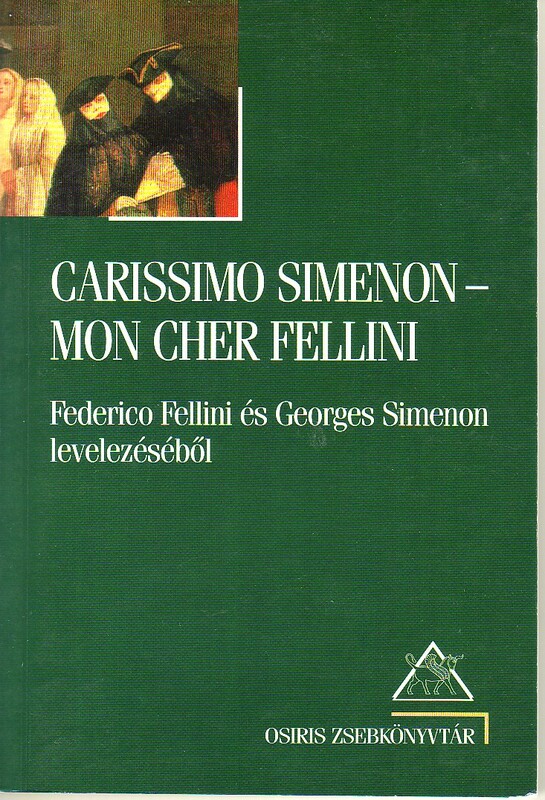 For starters, instead of writing to Maigret, Pigou (a guy in a hopeless situation who pulled the trigger) would write to the newspapers and become a national celebrity. He would also go to a lawyer who would 'negotiate' his surrender under 'favorable conditions', instead of coming to Maigret in the middle of the night. Those conditions would include a plea bargain, avoiding trial and scandal. Let's not forget a publicist who would arrange numerous appearances, interviews, book and movie deals. 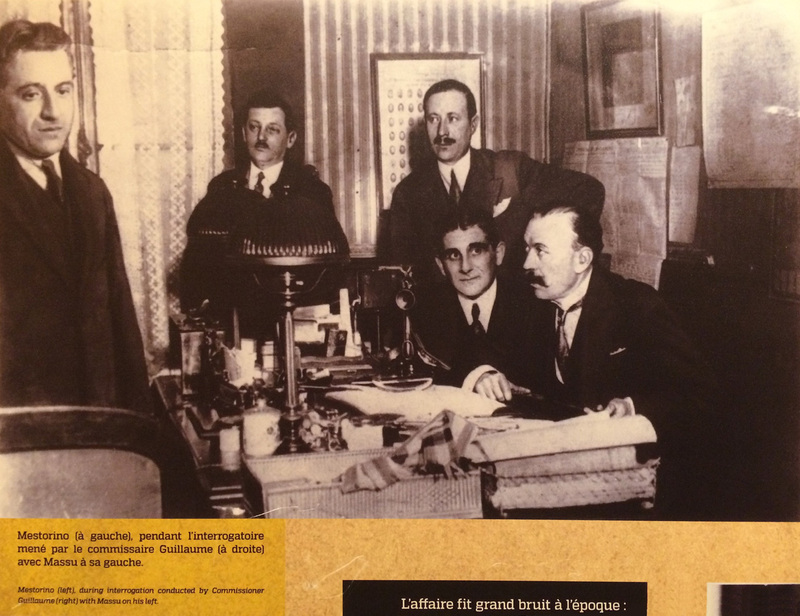 Further, a successful legal action by the ladies abused by Chabut (the bad guy who got shot and killed) would all but wipe out the 'Le Vin des Moines' (Chabut's company), making numerous discrimination lawyers very rich in the process, and leaving Louceck (the bad guy managing the office) without a place to work, which would suit him fine, since he was the one who started the snowball of trouble rolling. The media would enjoy a boom. 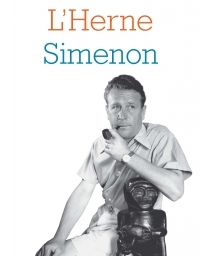 8/15/13 	Has anyone been to or been following this Simenon film festival in NYC this month? 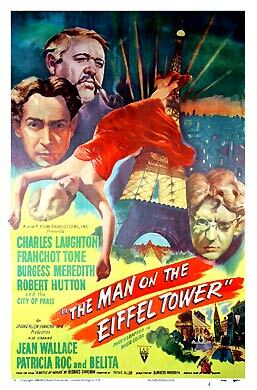 Burgess Meredith's (1948) The Man on the Eiffel Tower (La Tête d'un homme), with Charles Laughton as Maigret, is scheduled for August 18 at 6:45 PM. Simenon remarked more than once how much he loved painters, particularly the impressionists, who made their colors sing, and who no doubt influenced his own literary work. In his own way, Simenon also knew how to use color... to depict an atmosphere, a landscape, or a character. In this study I'd like to examine the use of color terms in the Maigrets, to see how the author uses them, which are used most often, for which descriptions they are reserved, how they contribute to the rendering of an atmosphere, to set a scene, and to highlight feelings and impressions. We recognize, following Michel Pastoureau ([Dictionary of the colors of our times], Bonneton, 1999), that color is a symbolic and cultural notion, and thus linked to a given society. Historically, color in Western culture is organized primarily in a ternary mode, dating back to prehistoric times and built on the three colors, white, black and red. From the Middle Ages, and up to our time, the symbolic system of Western culture revolves around six colors: white, black, red, blue, green and yellow. These six basic colors are unique in that they do not have referents in nature, contrary to what Pastoureau calls the "half-colors", such as rose (pink), violet, or orange, terms derived by reference to an object. For this inventory I've made of the corpus, I've considered the basic terms used (in French) to designate the colors, the adjectives "white", "black", "red", "green", "yellow", and "blue" for the six basic colors, and the other adjectives designating a color, "violet", "orange", "brown", "gray", and "pink". These eleven terms represent our range of color symbolism, also called the "color field". Note also that our vocabulary includes other terms for the different colors, corresponding to nuances within each of the eleven chromatic fields. However, as Pastoureau writes, "Absolute synonymy, as we know, does not exist. This is perhaps truer for the vocabulary of colors than for any other field in the lexicon. A word like red can't be replaced by a synonym. ... Words like garnet, carmine, vermilion, can only designate certain shades of red  they are not interchangeable with it, and even less so among themselves." And so we will also examine whether Simenon, in his texts, utilizes these shades of color, and if so, what is their frequency with regard to the use of the basic terms, and for what semantic purposes they are employed. 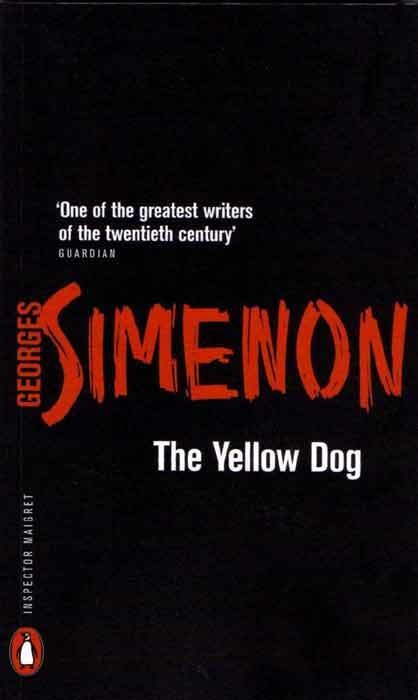 Simenon then uses almost equally yellow (the latter, as we shall see, often appearing as the shade "blond"), blue and gray, which take on more importance with the author than in basic system. Brown is more often used than green, clearly not a preferred part of the author's color system. We find next pink, after which occurrences of purple are rarer, and finally orange even rarer still. We also note that if we do an analysis based on the three "periods" of the corpus, we find that the three colors of the original system (white, black, and red) remain the most frequent, regardless of the period. But for the Fayard period, the next most used color is gray, followed by yellow and blue, while in the Gallimard, green, yellow and blue are ahead of gray (Simenon's desire to "put some color" into a historically difficult time?). For the Presses de la Cité period, yellow and blue surpass gray, followed by brown and then green. And so we note a "decline" of gray as we move through the corpus, in favor of more vivid colors, and we might dare to suggest that this corresponds to a certain lightness of the atmosphere in the novels of the last two periods, in contrast to the "darker" atmosphere of the Fayard texts. This is rather parallel to what we noted with regard to the meteorological descriptions in the corpus, where we saw that Simenon tends more and more to put his character on stage during the summer, and less and less under the autumn mists. We note that this increased lightness of the atmosphere corresponds at the same time to a greater psychological depth in the plots, which tend to approach, in essence, that of the "hard novels". In the remainder of this study, we will consider each color according to its appearance in the Maigret corpus, examining the use of the term  the concept described by the color, the objects or concepts to which is it applied, and the author's purpose in assigning it. 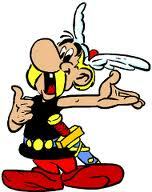 description of a character, by his clothing and physical appearance (skin, hair, eyes, mustache and hair in general). description of a landscape or scene to provide an "ambiance" for the scenes described. We can summarize the symbolic field of black as encompassing three domains. For one, everything evoking "negative" ideas (death, mourning, dirtiness, sadness, etc.). Second, in contrast, a domain of "positive" concepts (luxury, elegance). And between the two, a domain more or less "neutral", with notions of austerity and authority. In the corpus, the use of the term "black", while associated with the description of the three semantic fields noted above, will also show certain aspects of the symbolic field of that color. This remark is equally valid for each of the colors studied, so it will not be repeated in the following text. We note first that for the black of eyes, hair (including beard, mustache, hair in general), this color attribute is less frequently used than others (as white, gray, brown or red) to describe this physical aspect. Note: See the English translation for the continuation of this "black" section. The translation is complete through "black". Translation of the additional colors appear weekly in the Forum, color by color. The French text is complete. 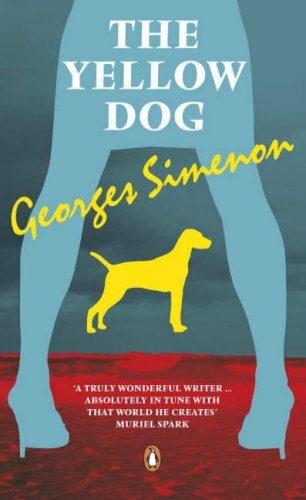 9/8/13  Having been hooked on anything written by Georges Simenon, I think I've read every novel that was translated from his works into English, other than a few of the Maigret's Christmas short stories. Do you have any information if any previously untranslated works will be translated and available anytime to those of us in the US (or, I suppose in the UK also), whether it be novels or short stories, or quite frankly anything else by him? 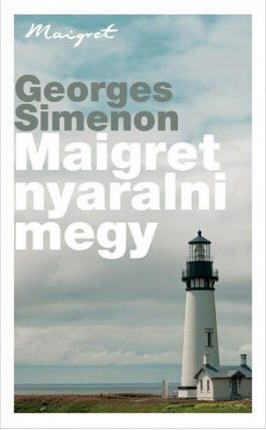 Penguin recently clarified its project of publishing new English translations of the Maigret series. The first novel is expected within a few weeks, followed by a novel a month for 75 months, which seems like a tough schedule to meet. They’ll be 6.99 GBP (11.29 USD). Selections from the more literary series will be coming, too, but we can only hope the short stories will follow. 9/29/13  The Penguin page describing the new translation by David Bellos of Pietr le Letton (scheduled to appear in November), includes a small sample of the new text, the first four paragraphs of Chapter 2. La présence de Maigret au Majestic avait fatalement quelque chose d' hostile. Maigret's presence at the Majestic inevitably carried a suggestion of hostility. Inevitably Maigret was a hostile presence in the Majestic. Il formait en quelque sorte un bloc que l'atmosphère se refusait à assimiler. He was a kind of foreign body its organism would not assimilate. He constituted a kind of foreign body that the hotel's atmosphere could not assimilate. Non pas qu'il ressemblât aux policiers que la caricature a popularisés. Not that he resembled the policeman dear to caricaturists. Not that he looked like a cartoon policeman. Il ne portait ni moustaches, ni souliers à fortes semelles. He had neither moustache nor heavy boots. He didn't have a moustache and he didn't wear heavy boots. Ses vêtements étaient de laine assez fine, de bonne coupe. His clothes were well cut and made of fairly light worsted. Enfin il se rasait chaque matin et ses mains étaient soignées. he shaved every morning and had well-kept hands. He shaved every day and looked after his hands. Mais la charpente était plébéienne. But his frame was proletarian. 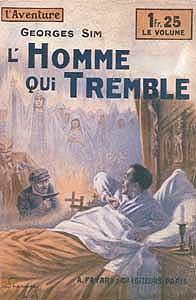 Il était énorme et osseux. He was a big, bony man. Des muscles durs se dessinaient sous le veston, déformaient vite ses pantalons les plus neufs. Strong muscles swelled beneath his jacket and soon took the crease out of even a new pair of trousers. His firm muscles filled out his jacket and quickly pulled all his trousers out of shape. He had a way of imposing himself just by standing there. qui n'était pas sans avoir déplu à maints de ses collègues eux-mêmes. which even many of his own colleagues found annoying. His assertive presence had often irked many of his own colleagues. 10/04/13  The juxtaposition of the two English versions for comparison with the original French makes fascinating reading. Thanks. I don’t know about you, but I’d have translated each and every one of them differently. Making something readable in English while preserving the French flavor is not easy. 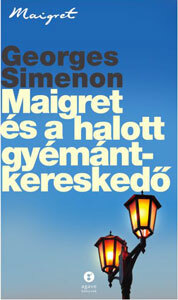 10/27/13  Are you aware of any Maigret audiobook sources? I'm looking for CD's or MP3s, in English. I'm a bit surprised there doesn't seem to be anything? Thanks for any help, and for the wonderful website! 11/2/13  Here's a scan of the cover of a copy of "The Yellow Dog" that I found last week in a charity shop. The title and author's name are in the new style, but the lack of a pictorial cover (see the recent post "New Penguin Maigrets") makes me think that this is a proof or review copy. Can anybody help? 11/8/13  Curious. The ISBN is for the 2006 Penguin Red Classic series release which was originally released with this jacket. This translation was first published in the USA as Maigret and the Yellow Dog by Harcourt Brace Jovanovich in 1987 and in Great Britain, under the present title, with minor revisions and a new Introduction, as a Penguin Modern Classic in 2003. 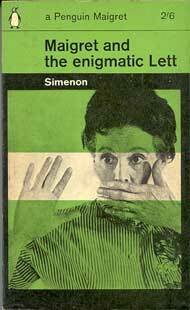 The title is not due for release in the new Simenon series until March 2014. The book I have is in standard paperback format, while the New Penguin Maigret series is to be in trade paperback format. The publication history information in the book is identical to that shown in the Penguin Red Classic edition (first printing). As already noted, the ISBN is also identical. So, the book appears to be the Red Classic edition, rebound as a proof, or possibly a preliminary version of the New Penguin Maigret release. 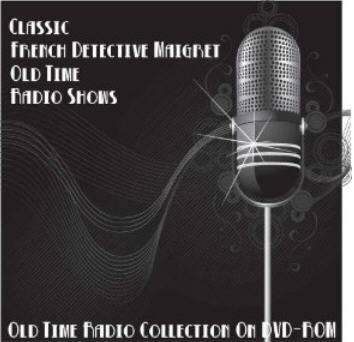 "...3 digitized reels of classic French Detective Maigret radio broadcasts..." Found here. Is there a copy out there? 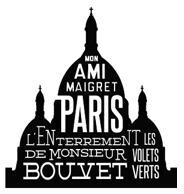 11/14/13  I have been reading Maigret novels since my fourteenth year and found along the way that they could help me learn French, along with Asterix and Arsène Lupin, so your forum is an ideal place for Maigret buffs. 11/28/13  I’ve just finished reading the new Penguin edition of Pietr the Latvian. Whilst I’m delighted that Penguin have taken on this task, and I shall certainly collect them all, I do have some concerns about the translation, which seems to me to be full of American expressions. 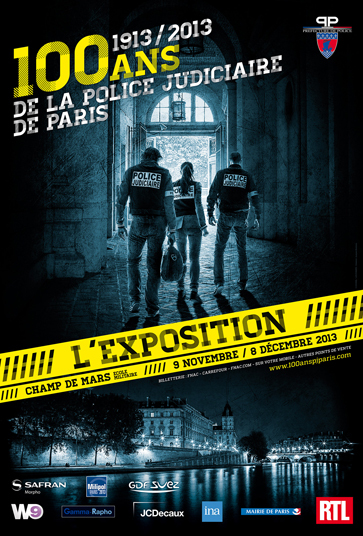 I have no problem with the American style of speech and writing, and I love the works of Dashiell Hammett and Raymond Chandler, but it does jar when you read “cop” and “guy” in a French novel written in the ‘30s. There are also some further anomalies. 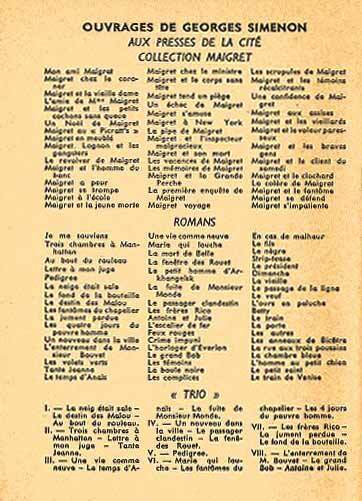 Towards the end, in the 1963 translation by Daphne Woodward, Mme Maigret is said to be …“stirring the stew that bubbled in her saucepan”... whilst in the new edition she is …“stirring the crackling Swiss fries in the pan…”. I don’t have the original French version to check for myself, but it does seem very odd to me. I believe that Simenon once said that he wished to strip out all the “style” from his writing that he possible could, and it seems to me that Daphne Woodward achieved this, and I think this is why such a minor matter irritates me so much. In any event, thank you so much, Steve, for hosting this excellent website for Maigret fanatics such as myself. 11/30/13  First, of all, thanks, Alan. I've just read the new translation myself... As for the Americanisms, they were generally invisible to me. But there were a fair number of phrases which struck me as probable Briticisms! I was first surprised by 'That's right. Sir go reception.' (9), which looked like it might have been a typo, but it turned out (thanks, Sam, for checking with Penguin) to be an attempt to render the porter's slightly broken French, " C'est ça, voyez bureau..."
With regard to Mme Maigret “stirring the stew that bubbled in her saucepan” in the Woodward translation, versus Bellos's “stirring the crackling Swiss fries in the pan”... In the original French it's ...“remuait le frichti crépitant dans sa casserole,”. So the French means "stirring the frichti crackling in her saucepan", and the question is, what is "frichti"? According to my favorite French-English dictionary, it's "nosh" or "grub", a non-specific food reference. Murielle cited this paragraph in the preamble to her (April 2012) article, Madame Maigret, and I see that I took the easy way out and translated it (here) as "stirring whatever was in the pot". So it seems there's a fair amount of leeway for the translator of that section. 12/01/13  Here are some pictures I took at the 100 years of the PJ show. It was interesting, but a bit expensive for what it was. 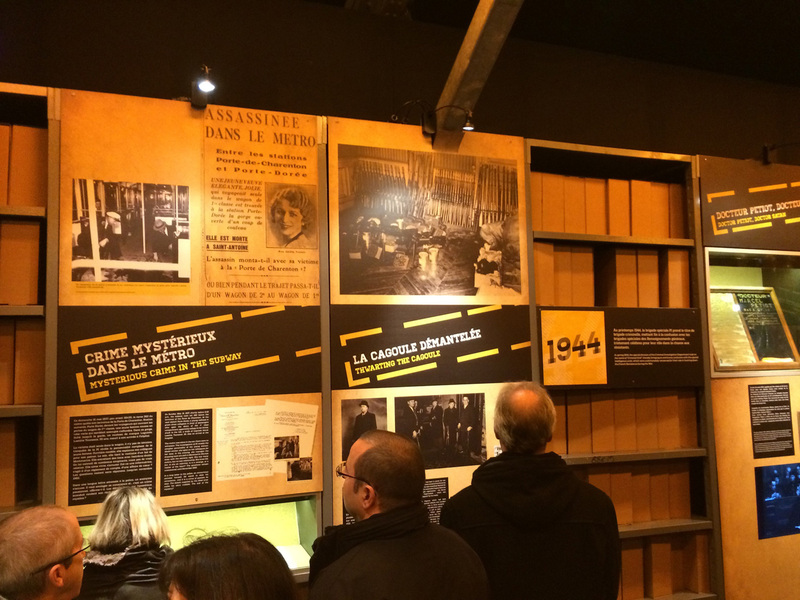 There was first a historical part and than a presentation of the actual structure of the PJ and a large display related to forensics. The last section was about the PJ in movies. 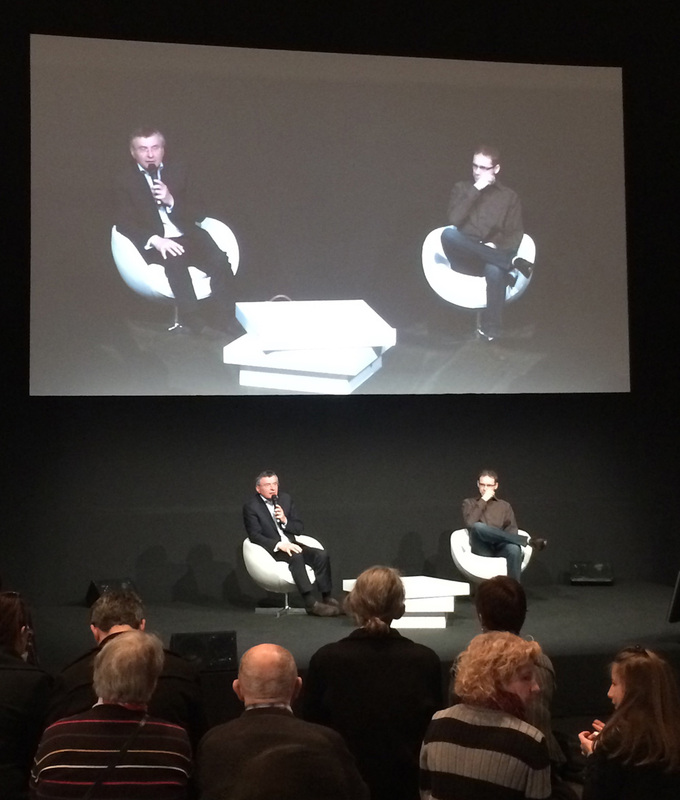 I attended an interview with Hervé Jourdain, who received the "Prix du Quai des Orfèvres 2014". 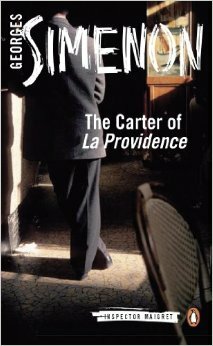 Except for the mention of Inspector Février, who became Janvier, and the Jean Gabin pictures, there was nothing about Simenon or Maigret... It was all about the real PJ. 12/05/13  Sorry, I cannot imagine Maigret eating Swiss fries, or French fries, and even less can I imagine Madame Maigret crackling them on her stove. A stew feels more realistic. 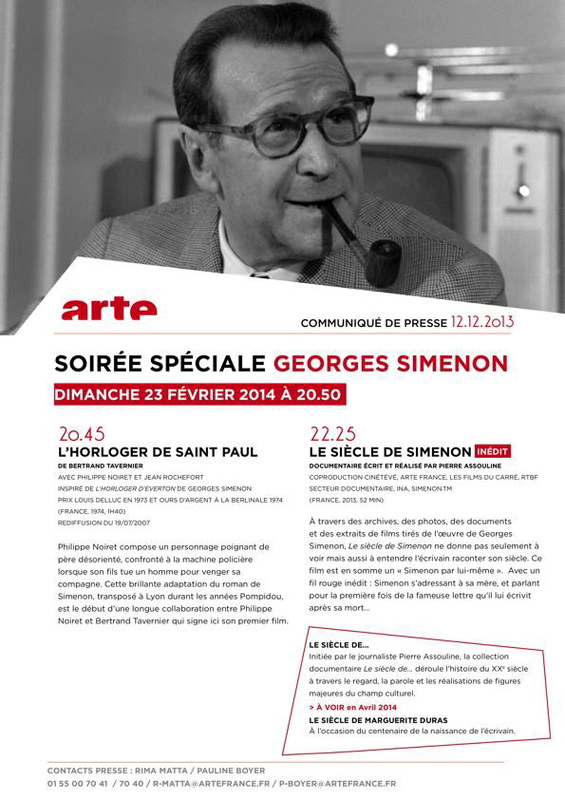 12/25/13  If any measure were needed of Georges Simenon’s creative genius and narrative skill, it could surely be found in the enduring popularity of his work among the hundreds of thousands of readers whose nearest approach to his crisp, spare, incisive prose is a series of almost uniformly wretched English translations. A piece of writing that is worth reading in French deserves to be translated into English that is at least natural, homogeneous, and idiomatic, if not urbane and polished. Instead we usually get a halting, maladroit, sentence-by-sentence replication of French syntax, French idiom, and French word order, pocket-dictionary equivalents of French words, and the occasional faux ami in a weird pidgin dialect that is spoken and written nowhere on earth and that screams “translation” at first glance. How can any bilingual reader perceive in this jerky, quirky, excruciatingly literal style a faithful English reflection of Simenon’s French? Examples have appeared recently in this Forum (9/29/13, 11/30/13). See also comments by Peter Foord (7-21-03, 11-01-04), David Simmons (10/4/13), and Vladimir (12/5/13). Does Simenon’s lean vocabulary and facile, minimalistic technique seduce rank amateurs into believing that translation is anybody’s game? Does a miserably low scale of pay attract incompetent scribblers and foster slapdash work? Is it too much to expect a professional translator to produce a passage of plain English such as the following? 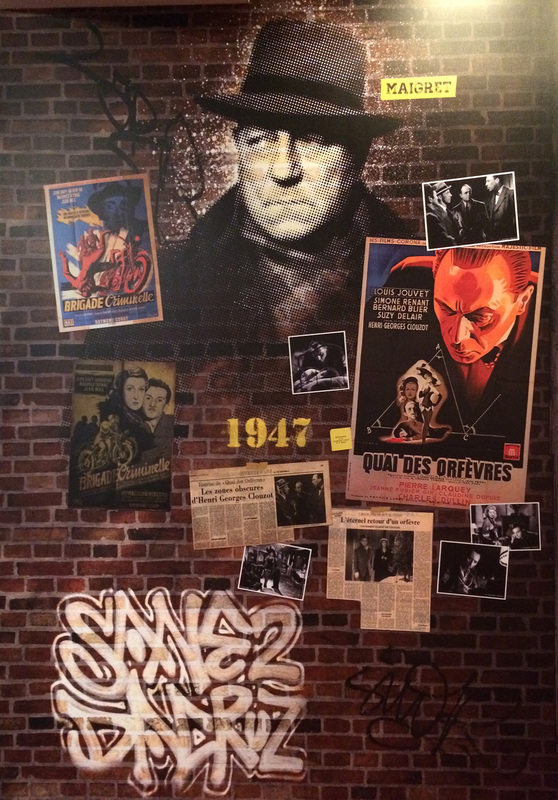 There was something jarring about Maigret’s appearance at the Hotel Majestic. In that setting he seemed a positively alien presence. 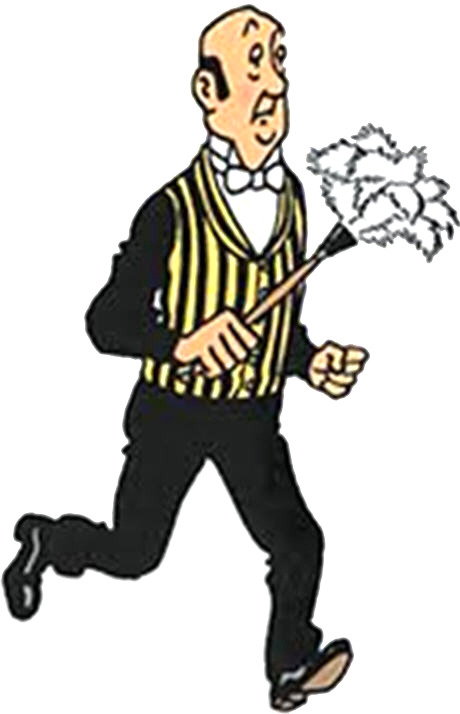 It wasn’t as if he bore any resemblance to the stock comic figure of the bewhiskered copper in thick-soled shoes. His smartly tailored suit was of decent quality worsted. He was clean-shaven and his nails were neatly trimmed. But his sturdy, rough-hewn build suggested a member of the working class. Brawny muscles bulged inside his coat sleeves. A brand new pair of trousers lost their shape before he had worn them a week. And then there was that way he had of just putting down roots, so to speak, wherever he happened to be, which rubbed some of his colleagues the wrong way. Since I’m only a rank amateur myself, I’m fully prepared to have this effort of mine damned as the worst of the lot. “Even a machine could do better than that!” “Not even close to the intended meaning!” “It may sound pretty to you, but it’s just not Simenon!” Chacun à son gout. 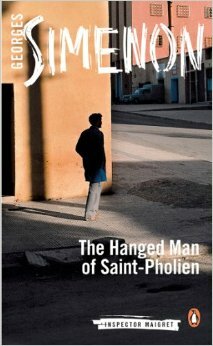 My advice to Simenon devotees who don’t know French: Learn French! 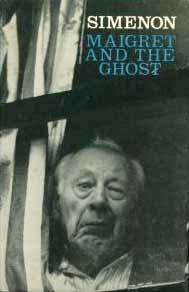 You couldn’t find a better tutor than Simenon himself. P.S. None of the above strictures apply to Steve Trussel, a top-notch translator whose Maigret versions, as far as I know, haven’t appeared in print.